I N D E X T H E F E D E R A L R E S E R V E B A N K o f S T . L O U I S | C E N T R A L T O A M E R I C A ' S E C O N O M Y S P R I N G 2 0 1 5 4 7 9 cdac spotlight Designing Opportunity: Ending Generational Poverty and Re-establishing Economic Stability in Rural America Preparing and Promoting Communities through Economic Analysis Building Creative Communities By Amanda Jones-Layman I n the face of a constant barrage of messages about the skyrocketing costs of college, Indiana families are hearing a new message: Every little bit helps. Promise Indiana (the Prom- ise), a grass-roots effort that began in Wabash County and is expanding to counties around the state, is dedicated to moving the needle on families saving and youth pursuing education beyond high school. 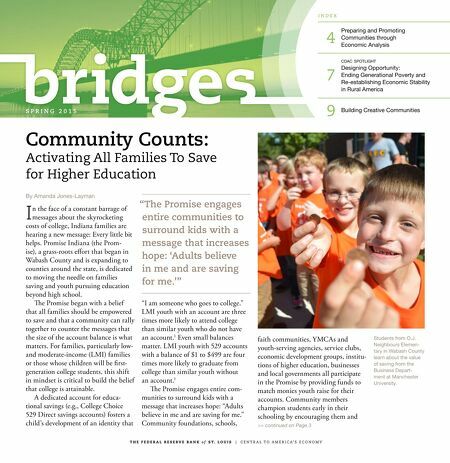 e Promise began with a belief that all families should be empowered to save and that a community can rally together to counter the messages that the size of the account balance is what matters. For families, particularly low- and moderate-income (LMI) families or those whose children will be first- generation college students, this shift in mindset is critical to build the belief that college is attainable. A dedicated account for educa- tional savings (e.g., College Choice 529 Direct savings accounts) fosters a child's development of an identity that Community Counts: Activating All Families To Save for Higher Education "I am someone who goes to college." LMI youth with an account are three times more likely to attend college than similar youth who do not have an account. 1 Even small balances matter. LMI youth with 529 accounts with a balance of $1 to $499 are four times more likely to graduate from college than similar youth without an account. 1 e Promise engages entire com- munities to surround kids with a message that increases hope: "Adults believe in me and are saving for me." Community foundations, schools, faith communities, YMCAs and youth-serving agencies, service clubs, economic development groups, institu- tions of higher education, businesses and local governments all participate in the Promise by providing funds to match monies youth raise for their accounts. Community members champion students early in their schooling by encouraging them and "The Promise engages entire communities to surround kids with a message that increases hope: 'Adults believe in me and are saving for me.'" >> continued on Page 3 Students from O.J. Neighbours Elemen- tary in Wabash County learn about the value of saving from the Business Depart- ment at Manchester University.